You are here: Home » Drinking Water » Is your drinking water safe? I receive a lot of inquiries about source water. People are concerned about contaminants in their water. Some of the fears that I hear are unfounded, but many are real. This article is about the contaminants found in your water, and which filters can effectively deal with them. I believe everyone should learn what is in their drinking water as soon as they move into a home. Have your water tested if your source water comes from a well, river, lake, or anything other than a municipal water supply. If you do have a municipal water supply, look up the results of their tests on the internet, or call your local municipality. Remember, they are working for you. It is very important to understand your source water conditions so that you can be confident in the safety of the water that you drink. As a starting point, it should be noted that Americans and Canadians generally have very good water compared to many other countries in the world. In municipalities, the water is regulated by the EPA in the States and Health Canada north of the border. The municipalities are obligated to meet minimum federal standards for water safety. Unfortunately, while the standards are met on average, that doesn’t mean that are met at all times. Even when standards are met, do you really want your family drinking water that is “not too bad”? The biggest problem with municipal water supplies is that while they are safe against things that will cause you to be sick in the short term, they are not particularly safe in the long term. Like so many issues in our society, the safety of our water comes down to money. Every homeowner wants lower taxes and water rates. Absolute purification is possible, but is obviously more costly. So, municipalities are faced with a trade off between cost and effectiveness. Everyone should have safer and better tap water, but until people understand the importance of water to our health, sacrifices will be made. Those that can afford to add filtration systems will enjoy better. It isn’t fair, but that is the way things work in our world. The question that I have to ask people who can’t afford basic filtration is: Is there anything in your life that you could do without in order to be able to have the best possible water in your life? Another question would be: What is more important than water? Our family is fortunate that it doesn’t have to give up anything to be able to afford the $100 per year it takes to drink good water. The proliferation of bottled water has been a huge business success, but don’t think for one minute that the water is any better for your health than the water that you get out of your tap at home. Most bottled water is acidic and carries a positive ORP (oxidation reduction potential), and both are bad for your health. In order to learn more about water, I have spoken with the presidents or owners of water ionizer companies, water softener and reverse osmosis suppliers, filter companies, and public works technicians responsible for municipal water quality. They all have different perspectives, and they all have something to add. There will never be agreement between all the different interest groups, especially when their livelihood is the source of the discussion. However, there are some basic and reasonably inexpensive steps anyone can take to insure that their water is safe. The bonus is that filtered water is also much more pleasant to drink because the filters remove tastes and odours. The following is a discussion about various factors and contaminants that can alter the quality of water. Water that comes from a municipal source doesn’t have to have a pre-sediment filter, but it is always a good idea to have one. You would be surprised at how much “stuff” accumulates on a pre-sediment filter that you install under your kitchen tap. The good news is that the filters only cost a few dollars at the most, so it makes sense to have one. When it comes to wells, or any water that is not supplied by a municipality, a pre-sediment filter is essential. Pre-sediment filters come in various sizes and filtering capabilities. Generally, I recommend a five micron filter, as it takes out the “big stuff”, but won’t clog up too quickly. Chlorine is used by municipalities as a low cost means of sanitizing water. Chlorine is a necessary evil as it is required to remove bacteria from the water. Chlorine can effectively be removed from water with carbon filters. Carbon filters will typically last 12 months and are available at building supply stores for about $25. You can choose from a GAC (granulated active carbon) filter or a carbon block filter. Both are effective. More and more municipalities are opting to use chloramine instead of chlorine for disinfecting the water. Chloramine is formed when ammonia gas is mixed with chlorine. There are arguements for and against chloramines, but Susan Pickford (see the comments below) provides a strong arguement against the use of chloramines. There are incident reports available in regards to respiratory issues caused by chloramines. However, to be fair, there are also carcinogen incident reports associated with the use of chlorine due to the formation of Trihalomethanes (THMs). THMs are known to be carcinogenic (cancer causing) and are formed when chlorine interacts with organic compounds (carbon chains) that are found in water. Municipalities that don’t use chloramines typically use ozone to treat for THMs. If your municipality uses chlorine for disinfecting the water, contact them and ask them what they are doing about THMS. Chloramines are definitely more difficult to remove from your source water. Reverse osmosis systems will remove chloramines, but we have already covered my dislike of them. You can purchase catalytic carbon filters that will remove about 99% of the chloramine from your water. The filters are not easily found, so you will have to go find a water specialty store. An under counter 2.5 inch by 10 inch catalytic carbon filter typically costs about $45 to $60. Many companies will attempt to sell you a carbon filters for use with chloramine, because they are less expensive, or the company simply hasn’t done their homework. Either way, don’t settle for a basic carbon filter or a KDF filter if you source water contains chloramine. I used to think that there was a legitimate argument both for and against fluoride. After a great deal of research, I can say with 100% confidence that Fluoride should not be in our water. Fluoride is a by-product of the waste from the creation of agri-chemicals or aluminum. Fluoride is a poison and should not be in our water supply. If you don’t believe me, read the label on a tube of Crest or Colgate toothpaste. You will be surprised. Fluoride is banned in Europe and Asia and it should be banned in North America. I won’t even go into the arguments for using fluoride, as the inclusion of the substance in our water supply is just plain stupid. While the EPA and Health Canada set the maximum allowable amount at 1.5 parts per million (ppm), most municipalities won’t include more than 0.8 ppm. Why do you think that is? 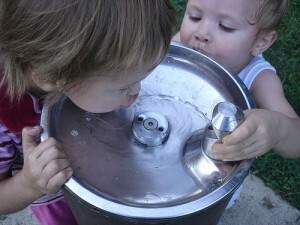 Approximately 2/3 of households in Canada and the USA drink water containing fluoride. If your municipality adds fluoride, ask them to stop. If you are unable to get the town or city to stop using fluoride, get a filter system to take out the fluoride if you can afford it. If you can’t afford it, think of ways to cut other expenses in your life, because removing fluoride from your family’s drinking water is important. You can remove fluoride with a distillation system or a reverse osmosis machine. I don’t recommend either as they remove important minerals that your body needs. Reverse osmosis systems typically make your water very acidic, which often makes your drinking water unsafe for drinking water by the standards set by Health Canada. Therefore, you need to add a re-mineralization filter which creates more potential health problems. This gets complicated….just don’t use this system unless you have no alternative. You can remove 75% of the fluoride in your water with an Activated Alumina filter, or 94% with two filters. While these reduction levels are not 100%, they are very effective and reduce the amount of fluoride to trace amounts. Activated alumina filters are not readily available from normal sources, so you will need to contact a water specialty company. The cost of the filters is typically about $45. When the odour becomes unacceptable, some municipalities may add ammonia to reduce the odour. The problem with combining chlorine and ammonia is that chloramines are created. Water ionizers do not eliminate chloramines. Medical grade chloramine filters are available that will eliminate over 90% of the chloramines, and they last approximately six months. Older homes that have lead plumbing pipes may have lead contamination. The best solution for lead is to use a carbon block filter, as it also removes chlorine, bacteria, and VOCs (volatile organic compounds). In fact, the carbon block filters are a great multi-purpose filter. The filters are typically found in a water specialty store and cost about $45 to $50 for an under sink drinking filter system. Mercury is found in both organic and inorganic forms. You can learn more about mercury at: http://people.uwec.edu/piercech/Hg/mercury_water/drinkingwater.htm. Heavy metal filters are available that will remove virtually 100% of the mercury found in water, and they last approximately six months. Sodium is not typically a problem in source water as it is acceptable up to 40 ppm (parts per million). Sodium concerns generally only occur when sodium is added to the water supply by means of a water softening systems. Drinking water produced by salt based water softening systems often contains sodium in concentrations in excess of 200 ppm. People should not drink water that has been softened with salt. They should also be aware that more sodium may be absorbed through the skin from taking a bath or shower in water that has been softened by salt, than from drinking water for an entire day. You might want to investigate salt-free water softeners if your source water is hard. As always, this article expresses the opinions of the author. Always consult your health care provider with health issues. 23 Responses to Is your drinking water safe? Great comments. I have been preparing an article on the effects of fluoride in our drinking water and you have covered a number of the issues. I have so many articles to write on many topics, so I will put mine on the back burner for now as you have provided a good foundation. Chloramine is a mixture of ammonia and chlorine — two chemicals that should never be mixed let alone ingested. Monochloramine, which is what the water companies are putting in the drinking water changes to di and tri chloramine with changes in pH and temperature. Tri Chloramine is a known respiratory irritant. Even more dangerous, however, are the highly toxic byproducts it forms. When ammonia in chloramine combines with organic material it produces byproducts known as NDMA, Hydrazine, Iodo Acids and DXAA. These byproducts are reported to be 100 to 10,000 times MORE toxic than chlorine and are cytotoxic (damage cells), genotoxic (damage DNA) and carcinogenic (cause cancer). Most European countries will not use chloramine because it is an ineffective biocide, leaving us exposed to e-coli, rotoviruses and polio 1. The World Health Organization has also cautioned against its use. hundreds of people are reporting acute health symptoms of respiratory distress, digestive problems, mouth ulcers, and skin rashes in chloraminated areas all around the country. When mixed with baby formula, chlormaine can cause blue baby syndrome, depriving the baby’s blood of oxygen. It leaches lead from pipes causing brain damage to children. Several massive fish kills have been reported around the country and in Canada as a result of main breaks in chloraminated areas. Chloramine literally ‘eats’ rubber and elastomer fittings causing plumbing problems in homes, businesses and in the infrastructure. Homeland Security is also concerned about the use of chloramine as it will allow bioterrorists to compromise our water system more easily than with chlorine. There is no upside for the consumer with chloramine, only higher profits for the company and their stockholders. See more about chloramine and how you can help stop the use of it at http://www.chloramineinfocenter.net. There is an on line petition to sign. Our group is working to get legislative and congressional hearings on chloramine and a moritorium on its use. In 1978 the EPA did place a moritorium on chloramine because of its ineffectiveness but were convinced to lift the ban in 1979. Thirty years of studies since have proven that they were right to have banned it and they should do so again. Our information is backed 100% by peer reviewed scientific studies. help us stop the use of chloramine. If your water company proceeds with chloramine and you begin hearing of these symptoms in yourself or neighbors and friends, document them in a journal with dates and pictures. Contact the Chloramine Information Center, your information will be considered for any class action suit that may be filed. Thanks for the post. Great information. I really enjoy the feedback from people like you who are dedicating their lives to support their causes. You have obviously spent a great deal of time researching chloramines. In fact, I think I spoken to you in the past if I’m not mistaken. If seems wise based upon your research for municipalities use chlorine and ozone to eliminate the THMs. I will keep researching. I know the cost difference is irrelevent to the municipalities, so the sole focus should be on safety. I’m trying to do my part with my blog. It is important that people be aware of what is in their water, and that they take the personal steps to protect their families while people like yourself do the dirty work in the trenches. You are propogating fear Susan. If you report the bad things about use of free chlorine in drinking water, you will see that they both have drawbacks but the cancer causing chemicals found in chlorinated waters are found at higher concentrations than waters treated with chloramines. When water is treated with free chlorine, you also produce di an tri-chloramines to reach break point so you can get a free chlorine residual in the water. Free chlorine is quickly lost as summer comes around so it is a problem to keep a disinfection residual through out the system. So essentially water at that tap can have a greater chance to have diseases than waters treated with chloramines. Also disinfection of water is measured by CT values which has to be greater than or equal to 1 which indicates that that 99.99% of viruses have been inactivated 99.9 % of giardia and 99% of cryptosporuidium when it leaves the plant. So regardless of what you use for disinfection you have to meet that value. Therefore, it is the disinfection residual in the distribution system that is more important. Chloramines mixed with baby formula does not cause a blue baby, as it is the high concentration of nitrates in the drinking water. The MCL for nitrates is set at 10 ppm so if exceeded your water utility would have to inform you. Thanks for your comments. I enjoy reading open debate that address important issues. I edited your comments a little to make them easier to understand, but I didn’t change the content in any way. The only thing I know for sure about chlorine or chloramines, is that I don’t want to be drinking either one. Proper filtration is essential and our cities are simply not doing a satisfactory job. Those that care about what they drink and can afford to do something about it, need to filter their drinking water, no matter what the politicians say. The only systems that you might find that do not filter water would be a very small plant that services very few individuals. For large plants it is not feasible to be able to filter the source waters before the waters are treated. Most cities I believe do a good job of filtering water because if they did not there would be a lot more cases like Milwaukee where hundred of thousands of people were effected by cryptosporidium. No matter what type of disinfected is used you are going to have some type of by product. Most of the MCL’s if exceeded will only cause negative side effects if it is a long chronic exposure. All disinfectants carry some sort of negative consequence but the risk of not using them is far greater. For the most part in order to limit the amount of chemicals that are needed to treat water we must first start with protections of our source waters. The reason all this money and research goes into water treatment is because the majority of source waters are not drinkable. Thanks for the contribution. Your point about the risk of not using disinfectants is far greater than the cost of using them is absolutely true. The goal of this subject is to help people understand that while the water that comes out of our taps is “safe” in that the water won’t kill you right away, there are things in the water that health concious people should think about removing. It mystifies me why so few people are concerned about what they are drinking based upon the belief that the their municipality “has their back”. The municipalities do what they can do with the budget that they have at their disposal. good info, thanks. A good book on flouride is recently reviewed in the Rocky Creek News; I’ve read it and was particularly appalled that 2/3 of your flouride load comes from wearing clothes and bathing in flouridated water. consider it possible the recent fish, bird and a herd of 200 cows can be related to chloramine’s ability to leach rubber; these are recent new events of January 2011. Interesting. I assume the book is referring to fluoride staying in clothes when they are washed. I can understand the skin’s ability to absorb fluoride from bathing or showering. I’m not aware of any shower filters that remove fluoride. Dry at 180 º C (300 mg / l), pH (9.5), silica (13.2 mg / l), bicarbonate (106.0 mg / l), chloride (39.6 mg / l), sulfate ( 59.0 mg / l), fluoride (1.2 mg / l), nitrate (0.03 mg / l), calcium (1.08 mg / l), magnesium (0.04 mg / l), sodium ( 105.0 mg / l) and potassium (2.0 mg / l). Since this a natural water very famous over the world i was wondering if this water is as good as the ionized alkaline water that comes out from the expensive machines like the Kangen brand.. And about the composition is there any value that is considered danger for the health? i ve been reading some stuff and got a bit confused….is it really needed to buy the expensive machinery or this high quality water is goood enough for health improvement? It sounds to me like you have a wonderful source of natural water. I think that in general, people should always opt for natural solutions before looking for man made alternatives. For anyone interested in finding natural source water, try visiting http://www.findaspring.com. The website cautions people to have the water tested, but I would expect that results would be available for each location if people searched for it. How much do you pay for your bottled water? I’m not a fan of bottled water at all for a multitude of reasons. The only bottled water that makes sense to me is if someone can find “real” spring water that is supplied in refillable jugs. In regards to your comment about whether the spring water is as good as ionized water from water ioninzers, I would have to reserve judgement until they were tested side by side and over a wide test group sample. Unfortunately, I’m not a big fan of the whole pH and ORP arguments that rage on and on over the internet. I’m working on an article that questions why water ionizers are effective. The real answer is that we don’t know. The good news is that they are effective. Just one more question. Ionized, oxygen rich and antioxidant rich water = alkaline? Ionized water can be alkaline or acidic. Ionized simply means that a molecule or atom has a posite or negative charge, which means it is missing or has an extra electron. An antioxidant is any substance that is capable of “reducing” or “donating electrons to Oxygen so that the potentially free oxygen (also knows as free radicals) can he rendered harmless. Ionized, oxygen rich antioxidant water would in fact be alkaline. Acidic water would be ionized but would not be oxygen rich, and would not be able to be an antioxidant. On the other site i read :”High pH water has More “reducing” agents (-ORP) and low pH water has more oxidizing agents (+ORP). Now my question is: the spring bottled water that i drink (read posts above) has a 9.4 pH so the ORP is always negative or can be positive too? I tested de pH with pH drops and is around 9pH but unfortanly i´m not able able to check the ORP. WOuld you be kind to answer my question? ps: Monchique water is at the same level as ‘Voss’ from Norway considered the most pure water in the world as the japonese ‘Fine’. ORP (oxidation reduction potential) is a measure of the electrical charge in a solution as measure by the presence or abscence of electrons. A negative charge is associated with a surplus of electrons (vs a neutral or non-charge) and a postive charge reglects a shortage of electrons. pH measures the availability of hydrogen and is measured from a scale of 0 to 14 with 0 being completely acidic and 14 being completely alkaline. Higher or alkaline pH results are associated with lower (negative ORP) levels in water produced by an electronic water ionizer. There is a relatiionship between the two measures but it is definitely not linear. The same pH level from two solutions can have very different ORP levels. I found out the the spring bottled water of Monchique that i´ve been drinking in the last week has a ORP of -139 mV. Not sure if the ORp will continue negative in the bottle for months..guess i´ve have to tbuy some ORP meter and test it for my self. Great research miguel , i buy monchique water too but always wondered about the ORP. Did the orp change when left in the bottle? I think glass bottles would be better. Negative ORP levels have a short lifespan so it is better to drink ionized water as fresh as possible. Thanks for reply, this water we are talking about has a PH 0f 9, there are mixed views as to whether you need to make it less alkaline like adding rice grains or sea salt, is this neccessary? I drink about 4 litres per day. I don’t know for sure if you need to make the water less alkaline. I don’t think anyone knows for sure. When I visited the factories in Kore few years ago, the engineers suggested the a pH of 8-9 was preferable based upon what they had been told by the Japanese. I know that I don’t like drinking strong alkaline water late at night because sometimes it upsets my stomach. Interesting stuff, would my spring water of ph 9 and ORP of -139 mV need to be ionised? If your spring water is healthy (no toxins or bacteria), it sounds ideal. A 9pH and -139 ORP are great numbers.. How long does the -ORP last?